The Bulldogs earned a power play just two minutes into the game on a neutral zone trip caused by a nice move by Dawson Tritt. They did get a couple of pucks on net, but also made a couple of unforced errors to allow the Kings easy clears. The Bulldogs would open the scoring just over four minutes into the game, when Evan Googins walked from behind the goal line up the right side and across the blue line before dishing off to Marcus Walter on the left half-wall. He would put a cross-crease feed onto the tape of Mackenzie Wight, who one-timed it home to make it 1-0 at 4:35 of the first. The lead didn't last long, as it was 1-1 two minutes later when Jayden Lee made a nice move to make a defender miss in the slot. He would walk in tight and be stopped by John Hawthorne, but he found his own rebound and one-timed it home blocker side at 6:43 of the first, from Ryan Brushett and Ryan Pouliot. The Bulldogs pushed back later in the period, with a series of shifts spent in the attacking zone, but couldn't take the lead. The Kings would go up 2-1 late in the period on the rush, as Josh Coblenz picked up a loose puck at the Bulldog line and was allowed to walk in tight where he used a defenceman as a screen and put a perfect shot past the ear of Hawthorne and under the crossbar to make it 2-1, with Ben Thomas and Matthew Byrne assisting at 18:09 of the first. The Bulldogs earned a power play on the following rush, and made quick work of it as Ryan Miotto accepted an Aaron Bohlinger pass at centre and dished off to Jackson Doucet up the left wing. He made a quick pass at the line for Dawson Tritt, and then took a return pass at the left point. Doucet would then walk in to the top of the left circle where he snapped a quick release low through the legs of Adamyk to tie it at 2-2 at 19:08 of the first. Shots after 20 minutes were 13-10 Bulldogs. The Bulldogs got in penalty trouble early in the second, with a couple of what I thought were soft ones after Ethan Jones had been tripped up earlier in the period. The Bulldogs fought through it, killing off a 30 second long 5 on 3 power play for the Kings, and the following penalty. They would earn a power play chance of their own a few minutes later, and again made it count as Marcus Walter walked down the right side before feeding Ethan Jones below the goal line. 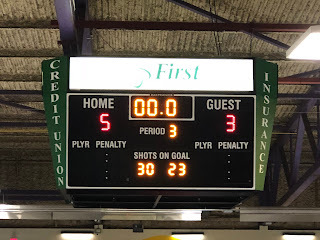 He would carry it behind the net and out the far side, before putting a perfect pass onto the tape of Mitchel Deelstra in the left side of the slot where he ripped a quick release far-side off the post and in high past the glove of Adamyk to make it 3-2 Bulldogs at 6:22 of the second. The Bulldogs would protect the lead with two penalty kills consecutively in the following minutes, doing a good job of supporting Hawthorne and clearing pucks in front. Keaton Mastrodonato would race in alone on a shorthanded breakaway, but he couldn't beat Mitch Adamyk on the backhand as it stayed 3-2 Bulldogs after 40 minutes. Shots in the period were 13-7 Kings, for a 23-20 Kings advantage after two periods. The Kings earned another power play early in the third, on another tough one to take as Mackenzie Wight attempted to check Josh Coblenz, who saw him coming and jumped out of the way and fell down with Wight being called for tripping. The Kings would score what was for all intents and purposes a power play marker to tie the game on it, a second after the opportunity elapsed as Ryan Brushett accepted a rink-wide pass up the right side where he walked in on a partial breakaway to the right faceoff dot where he blew a slapper high far-side over Hawthorne's blocker to tie it at 3-3, with Jayden Lee assisting at 5:03 of the third. The Bulldogs were again almost immediately penalized on a stick check from behind, and the Kings scored the go ahead goal on it as a rink-wide pass was accepted in the top of the right circle where he put a wrist shot past the blocker of a screened Hawthorne to make it 4-3, with no assists given at 7:56 of the third. The Bulldogs put up a valiant attempt to get back into it into the dying minutes, winning a long battle in the corner in the Kings zone with under two minutes to play, but couldn't generate the equalizer before allowing a backbreaker as Josh Coblenz accepted a pass across the Bulldog line and skated in alone where he beat Hawthorne five-hole to complete the hat trick for the 5-3 final at 18:50 of the third, with Matthew Byrne drawing the lone assist. Third period shots were 7-3 Kings, for a game total of 30-23 in their favour with Mitch Adamyk earning the win while John Hawthorne took the loss. The Bulldogs went 2 for 3 on the power play, the Kings went 1 for 7. The teams meet again tomorrow night, a 5:00pm puck drop.